AUDUSD will be volatile today due to some economic reports such as Unemployment Rate and Change in Australia and Initial Jobless Claims in the US. 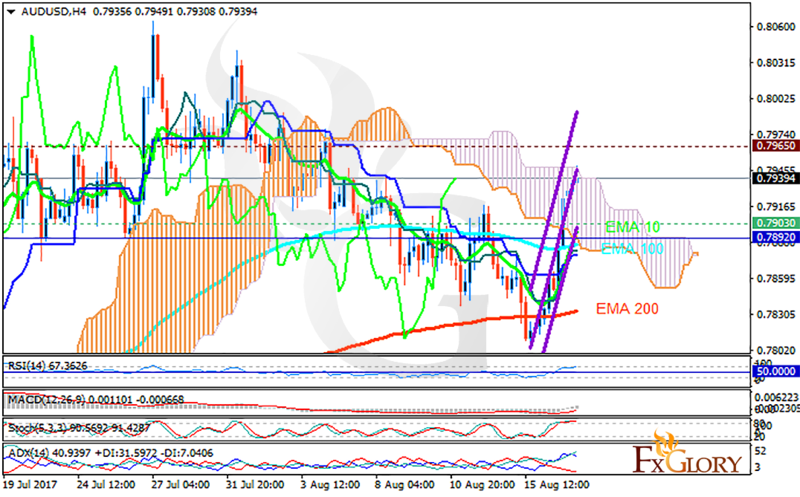 The support rests in 0.79030 with resistance at 0.79650 which both lines are above the weekly pivot point at 0.78920. The EMA of 10 is moving with bullish bias along the ascendant channel and it is located above the EMA of 100 and the EMA of 200. The RSI is moving in overbought area, the MACD indicator is in positive territory and the Stochastic is showing downward momentum. The ADX is showing buy signals. The price is above the Ichimoku Cloud and the Chinkou Span. The Tenkan-sen and the Kijun-sen are both showing a horizontal trend. While all indicators are showing an upward trend, the resistance area seems to be too strong to be broken; therefore, as the price may rise towards the resistance area, sellers can target 0.78770.